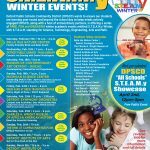 DETROIT – January 27, 2017– Detroit Public Schools Community District and major partners from the city’s largest and most exciting arts and scientific museums and venues announced a series of free, fun and exciting events with a S.T.E.A.M. theme to engage DPSCD families in learning activities after school hours at the participating venues and at well-known family-friendly spots, including the Detroit Symphony Orchestra, Detroit Institute of Arts, Museum of Contemporary Art Detroit, Belle Isle Nature Center, Michigan Science Center, Detroit Public Library, Charles H. Wright Museum of African American History, Eastern Market and The Rink at Campus Martius Park. Other partnering organizations include Downtown Detroit Partnership, Detroit Public Television, detroitpbskids.org, and the Detroit Public Schools Foundation. We will use #STEAMyWinter to highlight venues and events for the community to engage in this unique learning opportunity with our partners. “We are pleased to partner with so many of the city’s most prominent Arts and Science museums, as well as family centered venues to create this extraordinary set of experiences for our current and prospective students,” said Alycia Meriweather, DPSCD Interim Superintendent. Many of the events will be open to the public, thanks to the partnering organizations. Some events will be specifically for invited DPSCD/EAA students that selected educators will choose based their display of S.T.E.A.M. ingenuity. Those students – called DPSCD S.T.E.A.M.-gineers – and a family member will receive special invitations. In cases where there are a limited number of slots for an event, DPSCD will make available a small number of free tickets for prospective students. Details on how to RSVP for events with a limited number of tickets will be available within one week at detroitk12.org/enroll. The partners overwhelmingly chimed in with their support. “The Charles H. Wright Museum of African American History is thrilled to be part of this DPSCD partnership. Today’s learners are tomorrow’s leaders. This robust cultural collaboration makes learning STEAM exciting and unforgettable. We look forward to welcoming participants to the Wright Museum,” said LaNesha DeBardelaben, Senior Vice President of Education & Exhibitions, Charles H. Wright Museum of African American History. 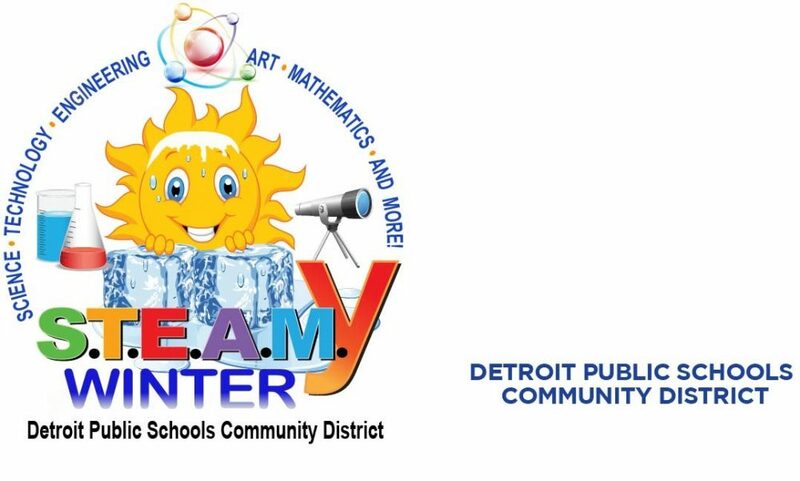 “The Detroit Public Library will joyfully continue to support and encourage the Detroit Public Schools Community District families through fun and engaging S.T.E.A.M. events,” stated Atiim J. Funchess, Assistant Director for Marketing & Communications, The Detroit Public Library. Saturday, Feb. 11, 10 a.m.-2 p.m.
Family-friendly Valentine’s event on “love” in nature with music, photography, bird seed and “bee mine” crafts and zookeeper talks on bird conservation & U.S. Forest Service. Nature Ambassador Joe Reilly concert at 2 p.m.
Sunday, Feb. 19, 1 p.m., 3 p.m. Select DPSCD/EAA students will receive exclusive free access to visit the Michigan Science Center and view the new IMAX® film – Dream Big: Engineering Our World. One hundred limited free admissions available for prospective DPSCD students. First come, first served; RSVP details to be at detroitk12.org/enroll beginning February 1. DPSCD Office of School Nutrition and Garden Collaborative offer a “Starry Night at Drew.” Event includes a cooking demo, healthy snacks, nature walk and bird feeder crafts at Drew Farms. RSVP required. Please call 313-651-3457 or email garden.program@detroitk12.org to reserve. Saturday, Feb. 25, noon-1:30 p.m.
Tots to middle school students experience a Star Wars performance by a small ensemble of DSO Musicians, plus art and music making activities. Star Wars costumes welcomed. Limited free public tickets for prospective DPSCD students. RSVP at detroitk12.org/enroll beginning February 1. Saturday, Feb. 25, 2-4 p.m. Curious students, young Einsteins, or future tech wizards who are always thinking of the next big thing are invited to discover and explore science with activities led by scientists and technologists with the hands-on exhibit, Inspiring Minds: African Americans in Science and Technology! 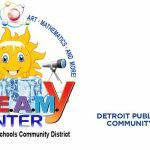 Visit the Charles H. Wright Museum of African American History for “Meet the Scientist Saturday” featuring David Head & Dr. Terrance Dillard on Saturday, February 25, 2017 from 2-4 p.m.
Sunday, Feb. 26, 10 a.m.
DPSCD showcases a “Robotics on Ice” competition with invited DPSCD students at 10 a.m. Public is invited to view. Families can engage in Chess in the Park activities, sample cherry slurpies by DPSCD nutrition staff. Saturday, March 4, 11 a.m.- 2 p.m. Discover “Science Behind the Art,” a virtual field trip produced by DPTV, on the science of the DIA’s Conservation Lab; investigate technologies and innovations of ancient civilization; Career talk by Andrea Montiel De Shuman, Digital Experience Designer; Gallery games, drop-in workshops and more. Sunday, March 5, noon-3 p.m.
One-day event where students aged 12-19 can attend up to four 30-minute classes with the industry-professional faculty of DIME Detroit. Subject areas covered are guitar, bass, drums, vocals, songwriting and music business. Students rotate between designated classrooms. Very limited free tickets for prospective DPSCD students. Reserve at detroitk12.org/enroll beginning February 1. Discover “Science, Technology, Engineering, Arts and Math” S.TE.A.M. 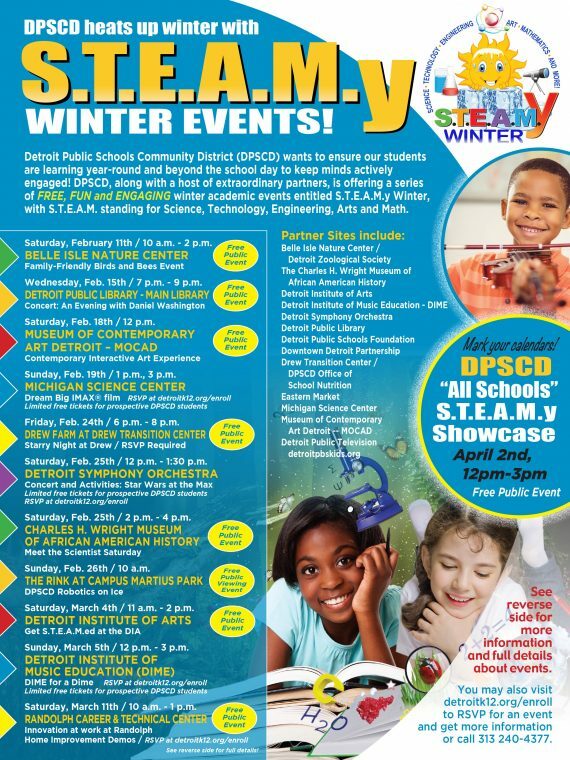 events with representatives of every DPSCD school. Give-aways! Science, tech and agricultural arts demonstrations. Learn about tuition-free Montessori, foreign language immersion and more.